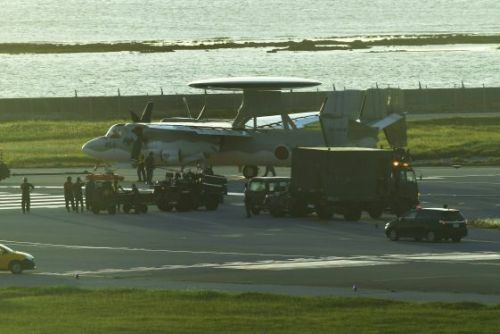 A Japan Air Self Defense Force (JASDF) E-2C airborne early warning aircraft stationed at Naha Air Base suffered a tire puncture shortly after landing at around 5:38 p.m. on July 17, while taxiing to the gate at Naha International Airport, causing the runway to shut down. According to the Naha Airport Office, as of 8:00 p.m. the same day 46 flights had been either cancelled or redirected. This paper estimates that including delays, the shutdown affected around 5,000 passengers on the 17th. On the north end of the runway, the aircraft was unable to move on its own and had to be towed; the runway was able to resume operation at 7:19 p.m., after a one hour and 41 minute-long shutdown. According to Naha Air Base, the punctured tire was the left tire on the front leg. None of the five passengers aboard were injured. There were no irregularities reported from the pre-flight check. The aircraft, which is attached to the Airborne Early Warning Surveillance Group 603rd Squadron, was returning from a regular training flight. A wheeled platform was placed under the punctured wheel, and the aircraft was towed to one of Naha Air Base’s maintenance hangars. Two YS-11 turboprop airliners scheduled to land at Naha Air Base were also briefly redirected to the U.S. Air Force’s Kadena Air Base. According to the airport office, rubber fragment from the ruptured tire were scattered on the runway, but all of the pieces were collected. Nine flights were cancelled, eleven flights were re-directed to New Ishigaki Airport, five flights were sent back to their point of departure, and twenty-one flights were delayed, the longest delay being three hours and fourteen minutes. It is believed that the effects of the runway closure will continue. On June 14, there was also an incident at Naha Airport, when a JASDF F-15 fighter rejected the direction of the air traffic controller and crossed over the stop-line in front of a runway, forcing a private aircraft to cancel their planned landing.